Why do mountain bike seats hurt so bad? Most mountain bikes are sold with basic seats and pedals for that matter, so an upgrade should be your first priority. What’s the best Mountain bike seat height? For a quick check follow the heel rule. When your heel is on the pedal, your leg should be totally straight. This means when the ball of your foot is on the pedal during riding, you will have a slight bend in your leg. This MTB saddle height will give you optimum efficiency and stop any back pains you might be getting. Note: The above is for standard trail riding, if you are looking to do lots of downhill then the saddle needs to be right down. This is why serious MTB riders use dropper posts – they can drop the seat with one flick of a switch (which sits on the handle bars). You can get way more technical if you are a pro rider. If you want to measure everything to perfection, get yourself a stationary trainer and apply the Holmes method! What’s the best Mountain bike seat angle? For most riders the best position of your MTB saddle is horizontal. If you are really into your downhill and own a full suspension MTB, then you would need to tilt the seat slightly forward. 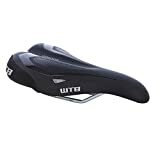 Are road bike (racing bike) seat interchangeable with mountain bike seats? Generally speaking YES. Though some seats are marked as ‘MTB’ – this is generally for branding. If you have a good bicycle seat on your road bike you can switch it to your mountain bike. The Selle SMP Extra Saddle below is a great example of a seat loved by road bike riders and MTBRs. Note: A few seats will not fit but the majority will. In the manufacturer's retail packaging. Americans rank the best for mountain bike builds, with brands like Yeti, Cannondale and GT. But the Italians have it for seats. And why wouldn’t they dominate the market, they produce the best leather goods in the world. The Italians also dominate a lot of design based items – think furniture, designed for sitting. Selle started making bicycle seats back in 1897 for every-day commercial bikes. What are Gel mountain bike seats? Instead of having foam inserted into the seat for padding, these seats have a gel substance which can mold to your body. See more gel saddles below. Why is this mountain bike saddle spilt/cutout? Decent mountain bike seats have a groove or totally cutout section like the seat above. This stops the pressure on your perineum which is the main cause of seat pain. Note: Cutouts are not just for women’s MTB seats, men suffer just as badly! K:ium is the combination of a particular metal alloy, a specific tubular design and a special finishing process which increases fatigue performance on the rail surface. Wing Flex Technology- Engineered flexibility along the edges where the inner thighs contact the saddle. When it comes to premium bike seats, it’s hard to beat anything by Fizik, or FI’Z:K which is how they brand their name. 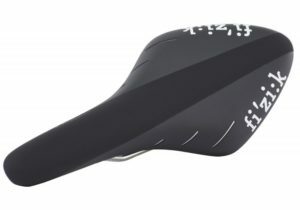 Fizik’s bike seats are common favorites of professional and high-intensity mountain bikers due to their quality craftsmanship and sleek designs. The Fizik Arione R5 comes in black or white/red, but you won’t be investing in this seat for it’s colour scheme. It is ultra-lightweight and reinforced for top strength. It is built with Fizik’s signature K:ium rails, which is made with a metal alloy and designed to reduce fatigue and stress on the rails. The seat also has a carbon reinforced nylon shell. The nylon is good for airflow and comfort, while the carbon reinforcement makes it one of the most durable bike seat materials available. The shape of the seat is really where it’s strengths shine. It is designed with wing flex technology, which consists of flexible inner edges where the thighs touch the saddle. This reduces chaffing and discomfort so you can focus on your riding. It also has a flexible spine which is beneficial for both shock absorption and comfort. It gives the seat less resistance as you switch from a standing to sitting position on your bike. It also contributes to the overall strength and longevity of the bike seat. Dual compound Soft-Shell base, ample padding and a shape that agrees with all. WTB has been around since 1982 and mainly specialize in bike seats and tyres. They have a strong following throughout the MTB community due the the quality of their MTB seats. People love their pricing – you can get a high quality USA built seat for under $40! The WTB Speed is used by professional riders and is their top selling model. Weighing 369g and with shock absorbent dual shell technology, the Speed is your #1 choice on a budget. SDG components is another company they specialize in mountain bike seats used by professional riders. We love the look of the Duster P and the tri alloy rails are strong. The seat itself has a 2-piece micro fiber cover with extra soft edges, which is said to aid cycling efficiency. PU and Dual-density gel foam padding is soft and elastic that save you from cycling pain. Carbon steel coil dual spring suspension helps smooth out bumps. Thicker soft saddle make you feel more comfortable. Universal design installs on any standard seat post. Easy mounting with the help of Zacro wrench. 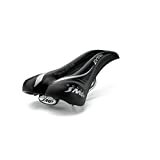 The Zacro Gel Bike Saddle is a great place to start for most bikers looking to improve their bike seat situation. 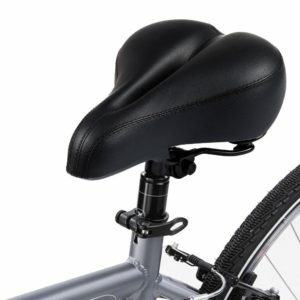 This is a bike seat that is an all around crowd pleaser. It will meet – if not exceed – the vast majority of any cyclists’ needs. 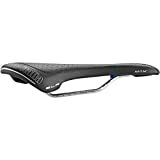 For starters, the Zacro Bike Saddle has dual density foam padding. The benefits of this are that it acknowledges the need for different levels of support at various points on your seat. The dual density gives you softer cushioning in the more weighted areas and lighter cushioning in low-impact spots. Complimenting this comfort system are the coil suspensions, with one located on each side of the seat. Most basic bike seats don’t come with any suspension at all, which leads to more harsh impacts against the seat while riding. The suspension adds some much needed forgiveness on rougher terrain or while riding over a curb. The coils are made of carbon steel so, making them capable of sustaining good suspension even after long term use. The Zarco is also a universal design, so it will fit easily on most bikes. It’s easy to install on any standard seatpost, avoiding the frustration of purchasing a non-compatible seat. Overall, the Zarco is a high quality, ultra comfortable seat that reflects the ideal all-around bike seat. 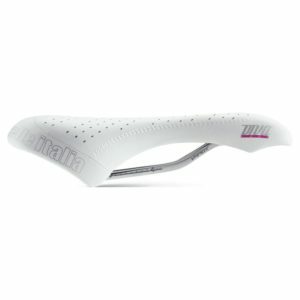 What is a women’s mountain bike seat? Women’s MTB saddles are designed slightly different from men’s or standard unisex seats you are likely to get from the manufacturer. Due to women having wider hips, the back of the seats are made wider. Many dedicated female saddles also have cutouts to relieve pressure on their bits. 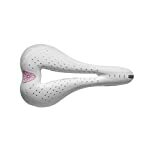 See the Selle Diva gel flow below. One major gap on the bike seat market has been bike seats built specifically for women. Most women require a slightly different shape of seat that isn’t always available in mens or unisex bike seats. Pro tip: if you’re an avid female cyclist, make yourself aware of the women’s specific bike seats out there. The differentiated thickness and center cut-out are specifically designed to fit women’s contours. This bike seat is a game changer for female cyclists who have thus-far used traditional style bike seats. It will be exponentially more comfortable, and as a result, boost your cycling performance and ability to bike for longer periods of time. The women’s-specific design is not the only thing the Selle Italia Diva Gel has going for it. It’s made with high quality materials, including high density foam and breathable full grain leather. The breathable material increases airflow and is highly durable. It also has 7 millimeter Vanox tube rails giving it a lightweight strength. Better yet, it has a 10% carbon composite shell with built in elastomers that are excellent for shock absorption on rocky terrain. 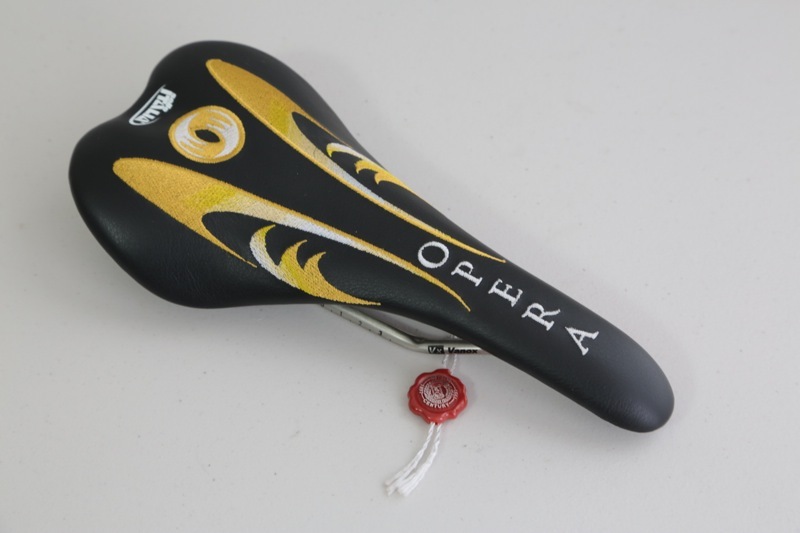 Overall, the Selle Italia Diva Gel is a premium quality bike seat from its build to its design. It is ideal for high intensity cycling, but as a women’s bike seat, any female cyclist will benefit greatly from this seat. HOLLOW DESIGN: Center cutout offers anatomic relief and ventilation, this bike seat relieving pressure on the perineum and providing airflow and comfort during long rides. 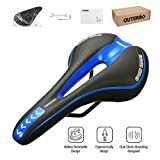 ERGONOMIC DESIGN: This bike saddle is ergonomically designed to be good for your cycling, Perform at your fullest potential on a saddle that can match your strongest outputs. And it has excellent shockproof and maximum firmness. COMFORTABLE & BREATHABLE: The foam padding provides ultra comfort and saves you from cycling pain. And the hollow-out design can Reduce the material in the middle of the saddle, make it lighter and breathable. EASY INSTALLATION & SUITABLE FOR MANY BIKE: The bike seat is very easy installation and suitable for all kinds of bike. The size of it is 10.5''x5.9'' and the weight is 330g, the narrower seat can increase your speed and relieves pressure on sensitive areas. 100% SATISFACTION GUARANTEE: If there any issue about this product, please feel free to contact us first, we will resolve this or refund for you. Please confirm this bike seat cushion can fit your requirement before ordering. The top selling MTB saddle on Amazon and ‘Amazon choice’ due to the sheer number of good reviews. Cutout, foam padding and great design and look for the price. Prostrate protection on the cheap! As noted above, Origin8 has a good record of making quality bike seats. This made it hard to put just one on our list, so we have included the “stepped-up” version of the Sport Uno-S; the Pro Uno-S. As the name suggests, the Pro Uno-S is similar in concept to the sport, but designed with more avid cyclists in mind. This is a bike seat for cyclists who take their sport a bit more seriously than the average commuter, although it’s a friendly enough design to impress even novice cyclists. 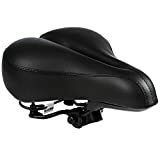 This is not the ideal bike seat for bikers on the cruiser-specific end of the spectrum due to its narrow design, but this is also what makes it a pro-style road bike or high-intensity bike seat. The Pro Uno-S is built with chromoly steel rails, a high quality rail that is both lightweight and durable. The narrow shape of the seat allows you to bike hard without chafing on your thighs, which is an exceptionally important feature for avid riders. The Pro Uno-S is an affordable, all around bike seat for those who prefer road bike style seats. It has all the basics, but is well crafted and ergonomically shaped, giving riders enhanced performance and comfort. If you want out to stand out from others MTBRs, go custom. Fizik has it’s own custom design tool on it’s site, but only allows you to adjust basic stuff like logo/color around. Very few riders will go down the traditional route and get a leather saddle, but for those who want to be different, Brookes make some of the best leather saddles going.